A cross between a traditional Japanese soaker tub with hints of a Swedish spa, the Natural bathtub by Italian company Puntoacqua bring a little luxury to be enjoyed every day. Finished in Canadian cedar, the aptly named Natural bath boasts an organic round shape that can be made to your size specifications to fit the interior design of your designer homes. 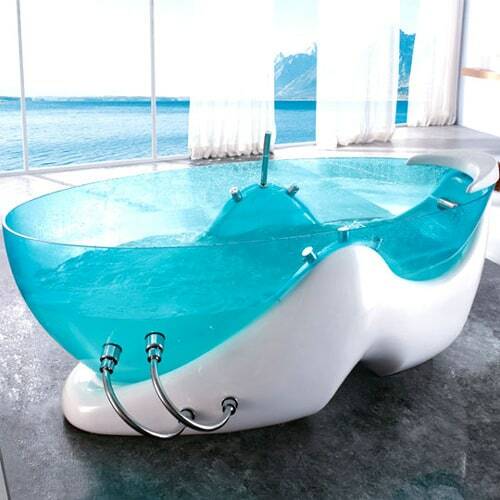 This deep tub invites you to sit and soak away your cares, and you get to do it in style! With wood being such a hot finish and accessory option for the bathroom, this tub makes a great addition to any spa at home. More details are available by visiting Puntoacqua. The strong design ideas of these limited edition ‘No 1′ bathtub by Corcel is sure to amaze. 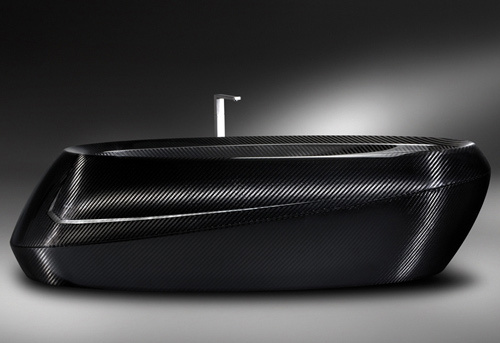 The shape is aerodynamic-like, with racy lines and curves – this carbon fiber tub is elegantly tough. 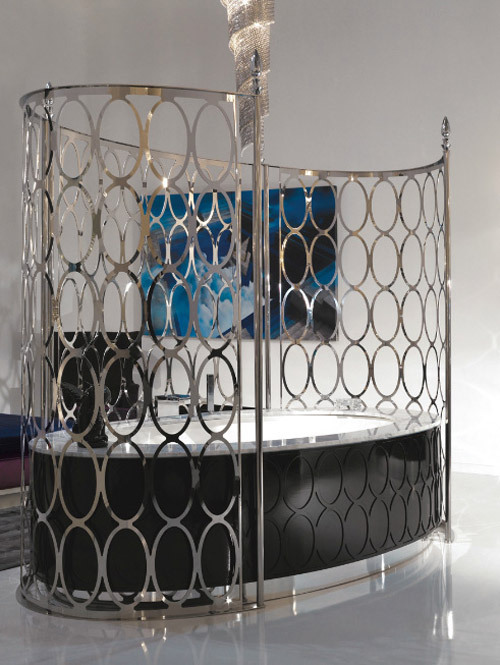 Perfect for the interior design of the luxury modern bathroom in your designer homes. The way its surface plays with light gives it a mysterious, black magic kind of allure. This piece is truly for those looking for something special and unique – something dramatic but in a straightforward, unfussy way. Go to Corcel to find out more on interior decoration, home design and other home decor products. 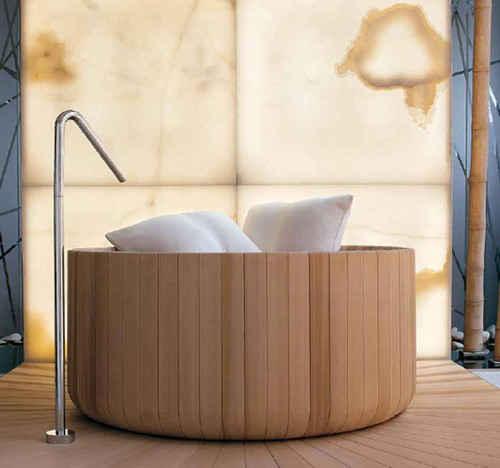 The Desiderio (‘desire’) wooden jacuzzi bathtub is by Italian company Tempoperdue (literally translated as ‘time for two’). Its name and design ideas reminds us that one need not always be in solitude to enjoy the relaxing and rejuvenating qualities of a long soak in the bathtub. This wooden jacuzzi tub is super stylish and warm, perfect for contemporary bathroom of your designer homes – and is available with hydromassage and chromotherapy options. And with specially designed, leather headrests and a central plexiglass table, you can take indulgence to the next level. Make a toast and place your champagne glasses down on the table as you lean back to enjoy some relaxing time together. Check out Desiderio to learn more about interior design and home decor. There’s something ultra modern and spa-like about a bathtub with lights – such as the Ergo bathtub by Hoesch. No matter which Ergo style bathtub you choose (corner, rectangular, square or oval…) you can enrich the bathing experience in your designer homes with LED lights. The bathtubs are designed to hold up to four tub spots and a light strip that is integrated into the overflow groove. You can choose from seven different colors to set the mood you desire. With an ergonomically designed bathtub such as this one, you can create the perfect ambiance in order to fully enjoy the relaxing properties of a bath. Check out Hoesch for more design ideas for your house design and interior decoration. If you’re going for timeless pieces for your bathroom decor then Regal – the cast iron tub by Devon&Devon is a perfect choice. It is inspired by an authentic classic style but modernized in its design ideas regarding functionality and materials. The cast iron tub is covered in polished aluminum and stands 70cm tall. Comfort played a huge roll in the realization of this tub, but as you can see, its aesthetic has not been compromised to suit the interior design of your designer homes. You can finish it with your desired look by choosing a well suited Devon&Devon tap, which are designed in many lovely styles for your beautiful homes. And if you wish to take it even further, you can let them do your whole bathroom design, from finishing, furniture and accessories. Visit Devon&Devon for more info on interiors, interior decoration and home decor products. 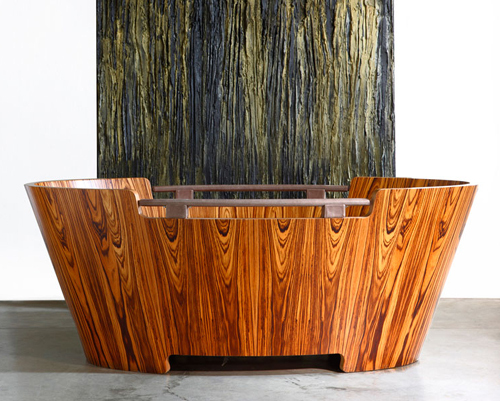 Feel like a king or queen in this glamour bathtub by IPE. This freestanding oval shaped bathtub is enclosed by a few metallic panels, which display a pattern reflective of the tub itself. These panels are quite interesting because from the point of view of the space, they nicely define the bathtub area, making it a special place without visually blocking anything and suiting the interior design of your designer homes. From within the tub, you feel, protected and safe with a sense of privacy and exclusivity. We love the glamour of the glossiness and the black and white design ideas. This bathtub definitely exudes a classic yet modern elegance and its design somehow hints to the allure of mystery and darkness. Visit IPE to find out more about home design and home decor. 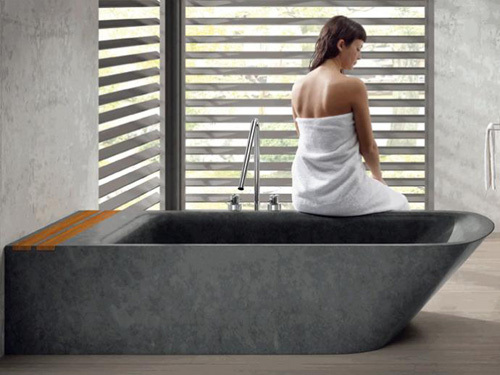 We are excited to share the Simi freestanding stone bathtub by Bathco with you. Not only does this bathtub boast contemporary design ideas, but also it is made of stone. Part of the Natural Series Collection, Simi comes in a light beige or a dark grey color to suit your bathroom decor as well as the complete interior design of your designer homes. What’s really great about a stone tub are the enhanced therapeutic effects that the stone brings to your bathing experience. Stone naturally retains heat, so you can imagine the deep penetrating heat of a bath in a stone tub. The water is hot, the stone against your back is hot and the length of your relaxing and restorative bath is increased. If you are looking to bring some of the luxuries of a spa at home, consider a bathtub such as Simi. Go to Bathco to learn more about these home decor products. We’ve featured many modern bathtub designs ideas by Glass here before, but that won’t stop us from sharing yet another amazing overflow bathtub called Arima for your designer homes. It’s a spa tub, designed to be built in or free standing. Equipped with whirlpool and air pool jets, back and feet jets, a heater, a waterfall and chromotherapy, this is an overflow spa, so the water is constantly circulating, replenishing and re-filtering. It’s really as luxurious and modern as you can get for an at home spa. Slipping into this spa tub ensures a full body embrace, total immersion into relaxation and rejuvenation. Wishing I had one right about now. Check out Glass for more info about Arima and to discover more of their great interior design products. 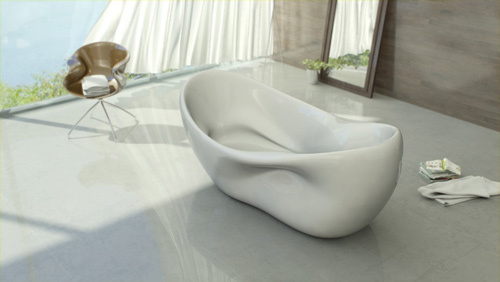 Made of a single continuous shape, the Charme fabulous bathtub by Nuvist seems ‘oh so’ inviting. Extreme comfort is promised due to the design ideas of the unbroken form, which provides support for the back, arms and legs. The water jets can be controlled by a series of buttons built into the armrests – so that custom relaxation and water preferences are always at your fingertips. It’s ergonomic, functional and gorgeously modern, a great addition to any contemporary space in your designer homes and current busy lifestyle. 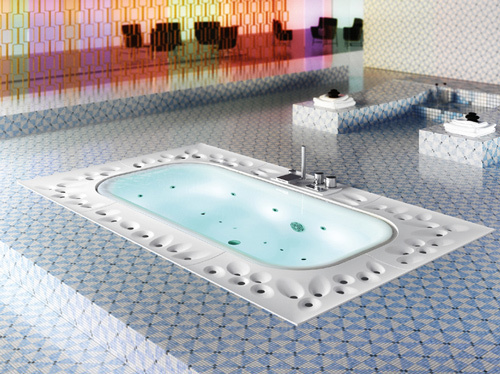 Learn more about the Charme bathtub created by Turkish architecture and design studio – Nuvist. Bali is a free standing oval tub by Italian company Aqualife, which combines a wonderful mixture of wellness, relaxation and appealing design ideas. The Bali free standing tub is simply beautiful, irresistibly inviting and stylishly modern and is sure to enhance your bathing experience and fits in the interior design of any designer homes. It has perfect curves, a minimal and organic oval shape and can even be fitted with a whirlpool system for the ultimate unwind. Aqualife’s main philosophy involves designing and producing products that encourage relaxation and harmony between mind and body. Bali is an excellent example of this. Visit Aqualife to learn more about these home decor products. If you can’t decide between a bath or a shower, then opt for Twinline2 by Artweger – a tub shower unit in one to fit in your designer homes. Every one has had days where time is of the essence and a quick invigorating shower is what we need. Other days, we yearn for some luxurious ‘me’ time and a long soak is in order. 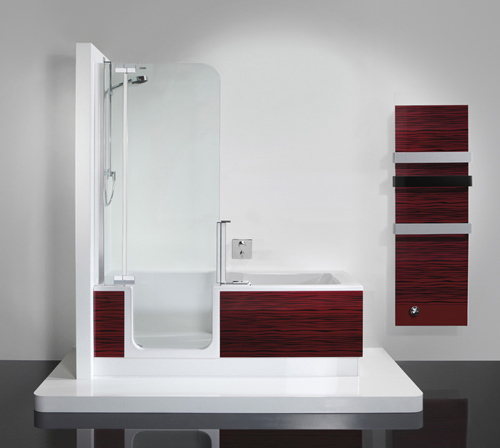 With this tub / shower unit, the option is always available to you. These design ideas of a tub shower unit in one are fresh and modern and the functional advantages are endless, also suits your interior design. Whether to suit your personal preference of the day, your family members’ different needs, a small bathroom space or to accommodate independent bathing as we age, Twinline2 is the solution – all while giving your bathroom a spa-like quality. Check out Artweger to learn more. Simulating a peaceful sea world, this transparent bathtub by Korra is sure to provide hours of relaxed bliss. Not only does it have an appealing and graceful futuristic design ideas, it’s a massage tub as well. Curved in all the right places to ensure support of the entire body, it promises to deliver the most effortless and calming bath you’ve ever taken. They have placed the jets to massage the most beneficial positions on the body based on acupuncture points. 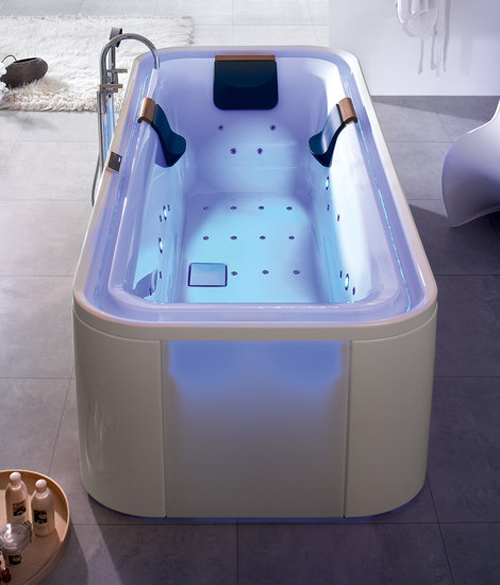 The tub itself is made of high quality, transparent blue acrylic board and the base is made of fiberglass. Find out more about this bathtub at Korra.